My grandparents made our Halloween costumes when I was a kid and decided to keep the tradition going, as long as the boys will let me. 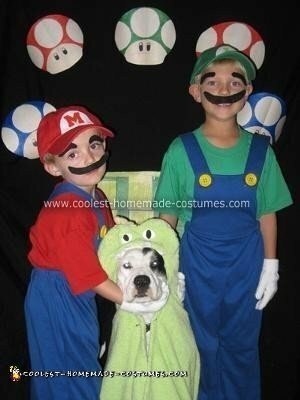 They boys wanted to be Mario and Luigi, but I didn’t like the store bought costumes. I only sew about once a year, so I recruited a friend to be my teacher. We found an “easy” pattern for clown overalls that I decided to use for the boys. After a few errors with cutting the fabric and many errors on the interfacing, I finally had the first pair of overalls done. The second one was much easier and smother, since I knew what I was doing. Once we had the boys try the overalls on, we realized that yes they were clown pants, so I had to go and take in the pants an inch on both sides. They fit so much better. We went and bought the buttons and used Velcro to secure the straps. I didn’t want a button hole, so if they needed to go to the bathroom, they could get them off easily. The hats we found at Wal-Mart’s women’s accessories dept. I went and got white felt and iron letters. I cut to fit cap. The shirts were just everyday t-shirts. I chose short sleeve as we live in AZ and it is too hot for long sleeve. Mustaches and eyebrows were made out of black felt and attached with Spirit Gum Adhesive. Works great. My boys dress up when they play. 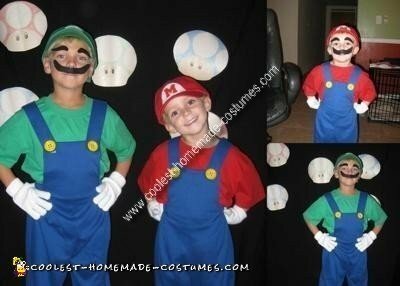 I know that these homemade Mario Brothers costumes will last for many years, or until they out grow them. For the dog in one of the pictures, we just used an infants dragon towel and safety pinned it for the picture. My dog doesn’t like clothes, but she sat still for a few minutes.